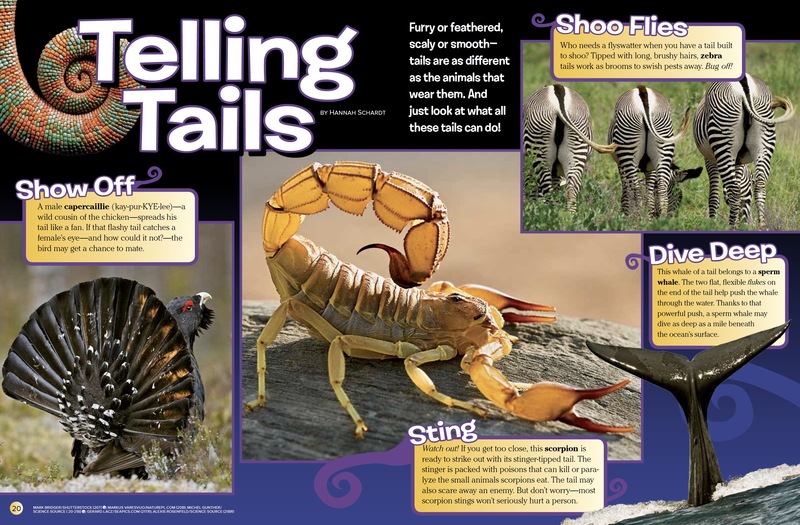 Furry or feathered, scaly or smooth—tails are as different as the animals that wear them. And just look at what all these tails can do! A male capercaillie (kay-pur-KYE-lee)—a wild cousin of the chicken—spreads his tail like a fan. If that flashy tail catches a female’s eye—and how could it not?—the bird may get a chance to mate. Who needs a flyswatter when you have a tail built to shoo? Tipped with long, brushy hairs, zebra tails work as brooms to swish pests away. Bug off! This whale of a tail belongs to a sperm whale. The two flat, flexible flukes on the end of the tail help push the whale through the water. Thanks to that powerful push, a sperm whale may dive as deep as a mile beneath the ocean’s surface. Watch out! If you get too close, this scorpion is ready to strike out with its stinger-tipped tail. The stinger is packed with poisons that can kill or paralyze the small animals scorpions eat. The tail may also scare away an enemy. But don’t worry—most scorpion stings won’t seriously hurt a person. Some animals have tails that are prehensile (pree-HEN-sul). These tails can grasp, almost the way your hands do on the monkey bars. The prehensile tail on this gecko keeps a firm grip on a branch, leaving the lizard free to swing down to a twig below. This hippopotamus isn’t shooing flies. It’s making poo fly! While pooping, the hippo spins its tail like a propeller, spraying the stinky stuff all around. The smell lets others know that the hippo has claimed the territory as its own. When too much of this kitten’s weight shifts to one side, its tail quickly moves to the other. This helps Kitty to balance on a narrow fence. 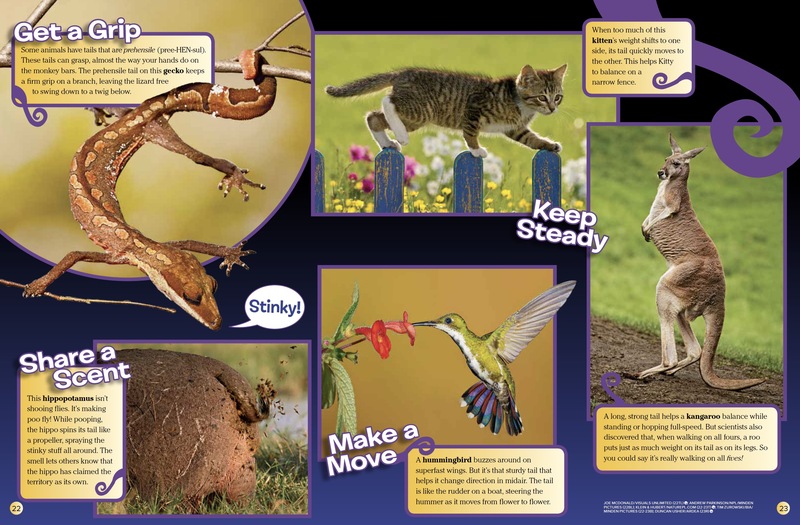 A long, strong tail helps a kangaroo balance while standing or hopping full-speed. But scientists also discovered that, when walking on all fours, a roo puts just as much weight on its tail as on its legs. So you could say it’s really walking on all fives! A hummingbird buzzes around on superfast wings. But it’s that sturdy tail that helps it change direction in midair. The tail is like the rudder on a boat, steering the hummer as it moves from flower to flower. Don’t worry: The tail on this skink is built to break! When a hungry animal grabs the little lizard by its tail, the tail drops off and keeps wiggling. This distracts the predator while the skink skitters off—tailless but safe. If the skink is young, it may even grow another tail. Everybody, look out! When it spots a threat, this beaver slaps the surface of a pond with its flat, scaly tail. The warning sound echoes far and wide, and the beaver’s family dives for the safety of their lodge. A long, puffy tail such as the one on this fox makes a cozy wrap on a freezing cold day. But for other animals such as squirrels, a fluffy tail held over the body can also be a built-in umbrella to keep off rain or provide shade. Slap and flash and even fling. Ąt the end, you find a tail! 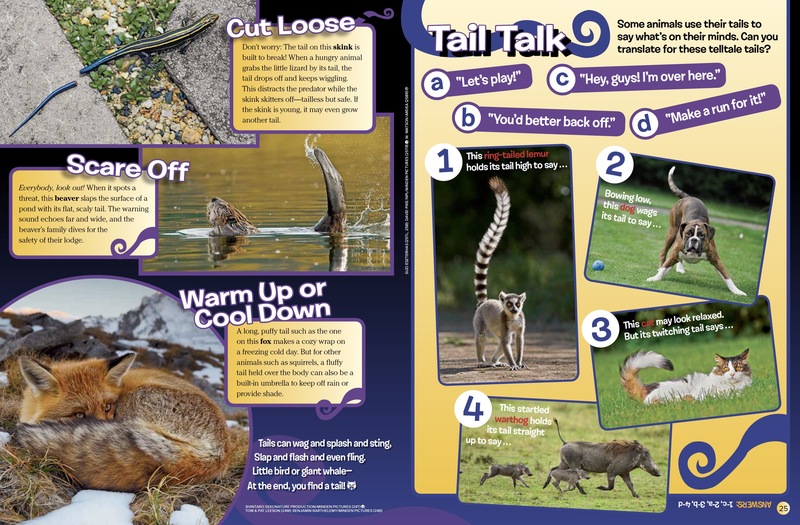 “Telling Tails” originally appeared in the March 2017 issue of Ranger Rick magazine.